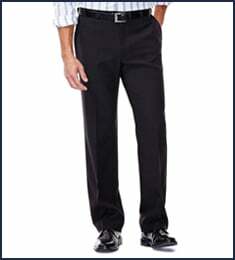 Big & Tall Premium Comfort Dress Pant is rated 4.5 out of 5 by 25. Rated 5 out of 5 by YARA from Comfort I purchased this product thinking I needed a bigger size, since most pants are not true to size. That is not the case with these. I feel Haggar is a great brand and even a better company. Rated 5 out of 5 by Pastor 1 from Great buy! Great pants, with great price. Will buy again! will recommend for any occasion. Rated 3 out of 5 by Charlie6 from Great pants I purchase these pants for the size I wear, but the were loose, baggie, and to short. I had to re-order and would advise going a size or even two down because of the expandable waist and you want have the extra material. 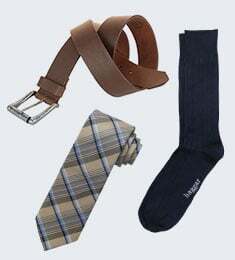 Your length may also change for a better, neater fit. 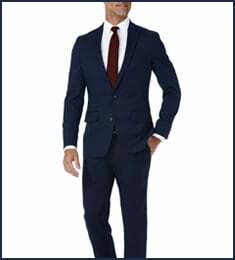 Rated 5 out of 5 by Sunshine62 from Ordering Made Easy I bought these pants for my husband and he just loves the fit and was extremely happy to receive them. They also came so quickly. It was so simple and economical. Rated 5 out of 5 by Content Buyer from Luv 'em! I now have four of varied colors. 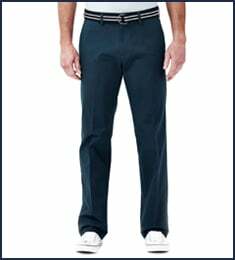 The classic fit, cuffs and flexible waist and long rise are the perfect combo of features for me. Also cannot say enough about the shirt gripper feature. Wish it was on all Haggar pants. Rated 5 out of 5 by Kumar from Dress pants I recently bought these. The expandable waistband is very nice. Very comfortable to wear. Rated 2 out of 5 by BJR07 from Great but too big I bought this in big and tall but was too loose in crotch area. I wear 46 which starts big and tall. The 44 wouldn’t button. They need more sizes or higher sizes that aren’t considered big and tall.